A strong heritage. A bright future. stereoscope with 14 images of early Beertonians. By 1900, it was suspected that the gun buried in the time capsule had been used by the late Richard Thompson (son of Beertown founder Aloysius P. Thompson) in the 1896 murder of Rhys Bramblethorpe’s chambermaid. Because of the recent advancements in forensic science, local detective Joseph Ferrier successfully petitioned for the disinterment of the gun for examination. The morning this was meant to occur, Aloysius Thompson drowned himself in the Thakiwaki River, leaving behind a suicide note asking the citizens of Beertown not to think too poorly of his son for the chambermaid’s accidental murder. When the time capsule was re-packed, it was thought fitting to replace the gun with this note, as a reminder that history should occasionally be reexamined in order to better understand the truth. Additionally, the bottle of ingredients had spoiled with age, and were replaced with a heartier sack of dried hops. 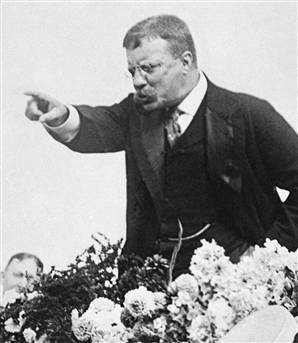 President Roosevelt gives an enlivening speech at Beertown’s City Hall. Though there was no plan to disinter the time capsule again until the 100-year anniversary of its original burial, the hasty masonry in the reinterment of 1904 combined with the flood of 1908 to create the necessity of an additional examination of the capsule, this time for water damage. Though most of the artifacts remained intact, the photo of B&T Brewery was badly water damaged. It was replaced with a growler commemorating the recent visit of President Theodore Roosevelt. Because four of the original artifacts had now been lost, it was decided in 1909 that the items in the time capsule should be reexamined every five years, in order to paint the more accurate picture of Beertown. 1911 marked the first planned, official Quinquennial celebration. The time capsule was moved to the vault of Beertown Bank & Trust, so that it would remain “buried” while remaining accessible every five years. Using federal money as part of a WPA project to rebuild parts of Beertown, the time capsule was redesigned for the 1936 Quinquennial. The design was evocative of a torpedo (in keeping with the trends in American time capsulry) and was large enough to hold both Bronwyn Bramblethorpe’s sewing maching and Teddy Roosevelt’s growler safely. It was made of aluminum donated by the B&T Brewery’s new canning division. For the 1971 Quinquennial, the time capsule underwent its final redesign, this time becoming reminiscent of a beer keg, in part to honor the now struggling brewery, and in part to accommodate larger items. This design remains with us today. We hope that you will join us this year to become a part of our future time capsule history.